The oil and gas industry in Kansas is as old as the state itself. C&B Equipment, a longtime KIOGA member, has participated for decades as the industry has expanded, contracted and pivoted. We KIOGA members generally know what’s going on in the industry, but a report from the Kansas Geological Survey at the University of Kansas really puts it together. It’s entitled “Oil and Gas History, Trends and Potential in Kansas” by K. David Newell, Ph.D. Any Kansas oil and gas company or KIOGA member would benefit from reviewing it. As active as drilling has been over the past few years, production is only a third of what is was during the heights of the 1950s and 60s. In 2009 when gas prices collapsed, 78 coalbed gas wells were drilled in Southeastern Kansas versus nearly 1600 in 2006 when prices were at their highs. The report shows the relationship over the years. The report shows the locations of horizontal wells, as well as permitted wells, and tracks the numbers of permits issued. It gives several financial case studies from Mississippian horizontal wells. Using “back of the envelope” math, the report estimates the cost of drilling a horizontal well at $3,000,000. Saying companies generally seek a two-year payback, the wells must produce at over $4000 per day (not counting operating costs). Thank you, Dr. Newell, for the great report. 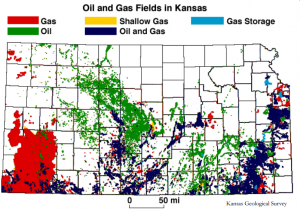 Click the link to view the full report by K. David Newell, Ph.D., Kansas Geological Survey, University of Kansas, Lawrence, and learn more about Oil and Gas History, Trends and Potential in Kansas. C&B Equipment is a longtime KIOGA member serving the oil fields of Kansas and Oklahoma with pump packages, field service, and superior engineering to keep production up and running.